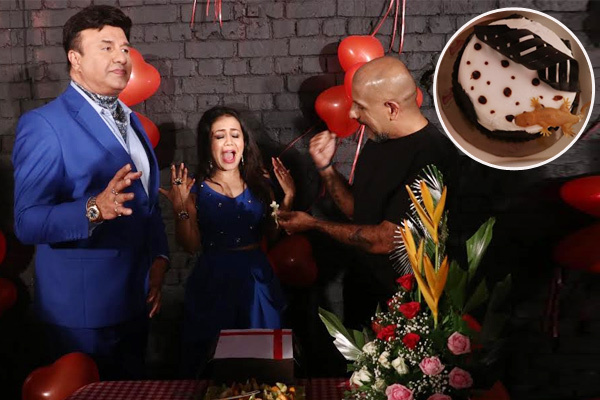 MUMBAI: Anu Malik and Vishal Dadlani, who are judging the new season of Indian Idol along pulled a crazy prank on Neha Kakkar, who is also their co-judge on the tenth edition of the popular reality show. It was Neha’s birthday and the Sony team took great efforts to celebrate it on the sets of Indian Idol, but Vishal and Anu were the pranksters of the hour. After meticulous planning, Anu Malik and Vishal Dadlani came up with a lizard cake for Neha. On seeing the cake, Neha, who seemed to be floored by their sweet gesture of setting up a birthday surprise, jumped in sheer fear. But, the singer also appreciated the fun side of her co-judges only to strengthen her camaraderie with them further. Indian Idol saw gruelling auditions across the nation. The show will be aired by mid-June on Sony Entertainment Television. MUMBAI: Rapper, singer and style icon Badshah who has been in the news for his first solo production Punjabi film Do Dooni Panj will release the 4th single from his movie called Fikar. MUMBAI: 1998 - This was the year when Chamma Chamma turned out to be a smash chartbuster all over. This was the time when the digital revolution was quite some distance away. MUMBAI: Indian Idol 10 has charmed the viewers across the country and people of all age groups, such as the popularity of the show. The Simmba team, Ranveer Singh, Sara Ali Khan, and Director Rohit Shetty will be seen on a semi-final episode of Indian Idol 10. MUMBAI: Top 6 contestants of Indian Idol 10 have impressed the viewers with their unfathomable singing week after week on Indian Idol 10. This weekend get ready to watch Rap star Badshah gracing the sets of Indian Idol 10 and enjoying the performances of the talented contestants.